For people who are blind or visually impaired, navigating unfamiliar environments can be daunting. Most of the visual cues others take for granted — maps, signs — are unavailable, leaving you with limited resources to draw upon. Wayfinding is a concept that applies (rather unsurprisingly) to find your way. This doesn’t just refer to visual assistance, though, but everything that makes reaching your destination easier. Wayfinding can include audio aids, smells or tactile elements (such as braille). For example, you may recognize you’re approaching your favorite cafe by the smell of its cakes or the sound of the owner’s voice. You may be able to run your fingers along the wall and feel the indentations in the sign. These little aids make getting around environments you know simpler. Being able to interact with your environment and identify your location or direction helps if you’re familiar with certain cues, but navigating places you’ve never been before is still difficult, even with orientation and mobility training (O & M). O & M helps people who are blind or visually impaired recognize where they are and know how they are going to get to their intended location. 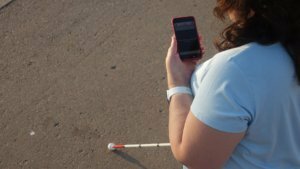 Combined with good wayfinding abilities, O & M involves sensory awareness, the space between objects, finding items/places and using canes to navigate/detect obstacles. As blind and visually impaired people develop their O & M skills, making their way from A to B should get easier. However, as powerful as traditional techniques are, cutting-edge technology allows for innovative solutions. GPS apps have given those affected by blindness or visual impairments more freedom, especially with audio directions, but what about indoor spaces? This has been a stumbling block for some time: as GPS apps rely on satellites to provide location data, they tend to be inaccessible once inside a building. RightHear’s indoor positioning technology provides users with audio assistance in a growing number of locations. This incorporates subtle beacons that can be installed with discretion: these enable the app to work efficiently inside structures of different kinds, offering consistent help. Our app can become an essential everyday tool in the lives of anyone who is blind or visually impaired, as much a part of their wayfinding as a cane or guide dog. This is easy to use and provides accurate information, working like a directory board; as users get closer to a virtual sign, our app tells you what lies ahead. Additional key details — the distance, opening times — are provided too. 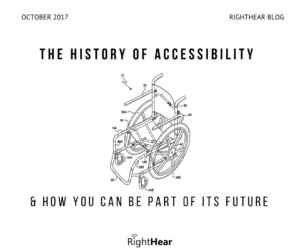 Accessibility for people with mobility problems at businesses of all kinds is better than it used to be, but those with vision-related problems are still underserved. Our team is dedicated to making a positive difference in the lives of our users, and we’ve installed hundreds of accessible spots in buildings across multiple countries. Our work gives people who are blind and visually impaired more independence, empowering them to explore indoor locations with confidence, safety and accuracy. As more and more businesses and organizations embrace indoor orientation technology, the more accessible the world will become. Is it easy to find your way for a blind person at your work space? we’d love to learn what technologies or method you’re implement.